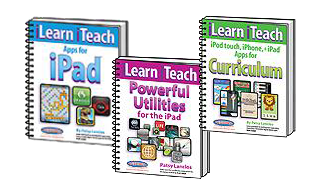 Learn and teach in exciting new ways using more than 130 mobile digital device apps. The iPod touch, iPhone and iPad mobile digital devices have changed the way we think about computing. We now can hold the computer in the palm of a hand and know that . . . "there is an app for that." These devices have great potential in the educational arena because they are very mobile, allowing for use any time, any where and any place. Put the pizzazz back into learning! Powerful utilities for students, teachers, administrators, and everyone! Make your iPad an effective replacement for the laptop or desktop. Requires an iPad™, iPhone™, or iPod touch™ mobile digital device. The iPad is a favorite of all age groups because of many factors including, but not limited to, portability, features, fun, screen resolution, audio output, versatility, and ease of use. Many schools are selecting the iPad as the device to use in a 1:1 scenario or on classroom carts, and decisions must be made as to the apps to install. With close to 400,000 apps available in the iTunes store for the Apple handheld devices (and more added continually), it is difficult to find the perfect app to address a particular task.